Jaye very kindly hosted an interview with the two of us on her blog the day of the launch. 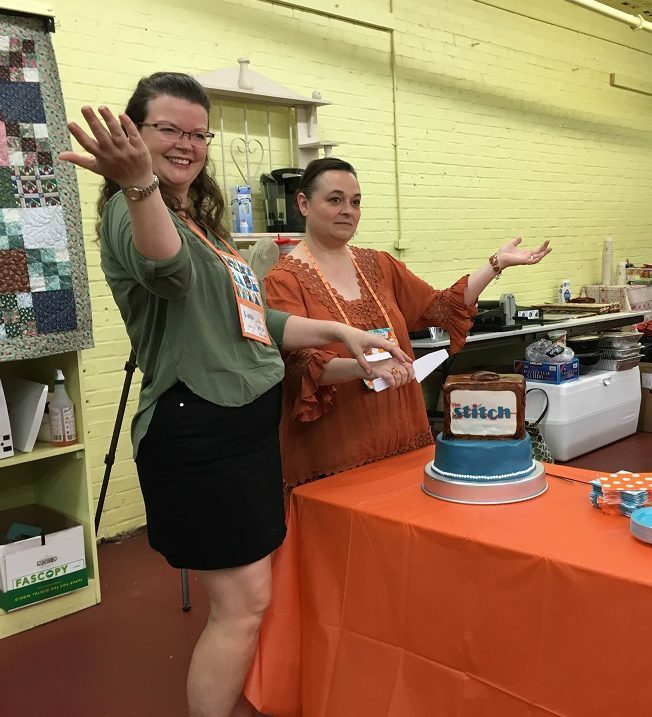 Jaye also sent a roving reporter to our pattern launch party on July 16. Read HollyAnne’s take on the party on Jaye’s blog. A nice little piece on pattern design in general from Jaye. HollyAnne also asked if we’d be game for an interview, so read that over on her new blog String & Story. And finally, the King Hands in action during the cake cutting. Special thanks to HollyAnne for the photo! And yes, we felt totally ridiculous cutting it like a wedding cake, and no, we did not feed it to each other afterwards. I should add “roving reporter” to my resume– I like that! Y’all sure have been busy and popular!